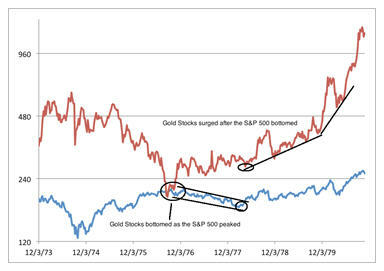 The relationship between gold stocks (while in a secular bull market) and the broad market (while in a secular bear market) is difficult to diagnose and that is what makes it so interesting. There is no single rule of thumb or axiom we can trust because history is quite varied. There are instances of the gold stocks crashing with the stock market, rising with the stock market and rising substantially while the stock market endures a nasty bear market. Currently, the gold stocks are moving into the latter stages of their third secular bull market in the last 90 years. Yet, the equity market could be at risk of soon entering a cyclical bear market. In this article, we review some history between the gold stocks and the equity market before drawing conclusions relevant to the near future. First, we look at the 1970-1974 period. The Barron's Gold Mining index is in red with the S&P 500 in blue. The BMGI essentially went sideways from 1970 until late 1972. In the same period, the S&P 500 enjoyed a very strong rally of nearly 100%. Leading up to the market peak, the S&P continued to rise while the BGMI declined nearly 30%. However, the BGMI would experience a spectacular rise at the time of the recession while the market was cut in half. Next we focus on the period 1976 to 1980. 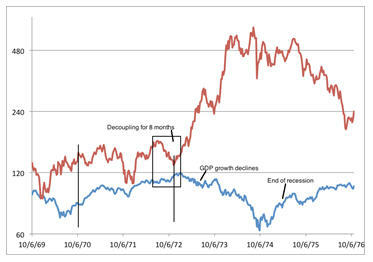 The BGMI declined from 1974 to 1976 as the S&P rebounded substantially. 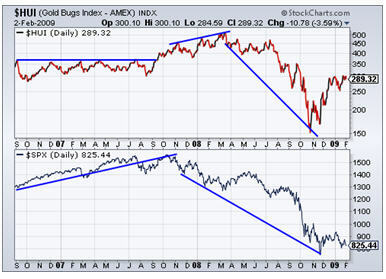 Then the BGMI bottomed nearly in lockstep with the S&P beginning a mild cyclical bear market. The BGMI performed well in 1977 but didn’t begin an accelerated ascent until the cyclical bear market in stocks ended. Next we review the 2000 to 2003 period. The HUI was cut in half prior to the onset of the 2000-2001 recession. The S&P of course, trended higher into 2000. After the onset of the recession, the two markets flipped. 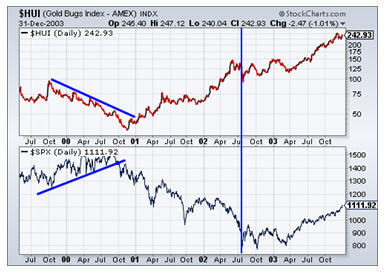 The gold stocks performed very well and the recession and bear market had no impact on the gold stocks. The 2007-2008 example is the most unique. The gold stocks were lagging into the stock market peak and recession but were not oversold as in 1972, 1976 or now. After the market peaked, the gold stocks continued higher for five months before crashing. However, the gold stocks would bottom five months before the S&P 500. Interestingly, this is most similar to what happened during the Great Depression. Both markets trended higher into the crash (1929) and then suffered during and soon after the crash. Yet, the Financial Times gold stock index bottomed in 1931, a full year before the overall market. What can history tell us going forward? The key is the correlation. If gold stocks are trending higher with the equity market into a potential recession and bear market, then the gold stocks would remain positively correlated over the intermediate term. However, we can see that if the gold stocks are in a cyclical bear while the broad market is nearing a trend reversal or while the economy is nearing recession, then the gold stocks will remain negatively correlated. This is evident in three of the four previous examples. The current market conditions are similar to those of 1972, 1976, and 2000. The S&P 500 is up 26% in the past nine months while the HUI is down 36% in the last 10 months. Judging from history, this negative correlation bodes well for the gold stocks should the equity market enter a bear market and the economy enters a recession. However, if the S&P 500 continues higher from here, the gold stocks would struggle. Conventional wisdom would immediately refer to the 2008 experience and dismiss the notion that the gold stocks could decouple. However, the current evidence strongly favors the decoupling scenario. It is also very important to assess the correlations with bonds and the US dollar. Peaks in bonds usually support precious metals but there have been times when both have trended higher (2001-2003, 2007, 2010). Strength in the US dollar will almost always put some pressure on precious metals. Currently, we have a situation in which equities, bonds and the US dollar are all correlated. Should bonds and equities begin a cyclical bear market, Gold and gold stocks (currently negatively correlated) will benefit. Moreover, odds are excellent that precious metals have bottomed and begun a new cyclical bull market. Investors who buy and accumulate shares at these levels will profit handsomely over the next year and several years. In our premium service we focus on the producers and explorers best positioned for and most likely to take advantage of the next leg up in this bull market in precious metals.